JULY 12--A secret Central Intelligence Agency report details the recruiting and organizing tactics of imprisoned al-Qaeda detainees and the difficulties faced by jailers in combating these efforts by disciples of Osama bin Laden. 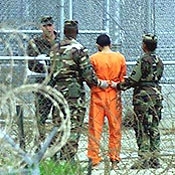 The report, prepared in August 2002 by the CIA Counterterrorist Center's Office of Terrorism Analysis, concluded that while detainees at Guantanamo Bay facilities were organizing and communicating in accordance with al-Qaeda training methods, U.S. officials were hamstrung to counter these moves without the aid of "inside sources." The CIA report, a copy of which you'll find here, notes that Guantanamo detainees enforced a code of conduct and sought to shield the identity of leaders through the use of surrogates. Additionally, inmates reportedly sought to "put their training into practice by establishing cellblock leaders and dividing responsibility among deputies for greeting new arrivals, assessing interrogations, monitoring the guard force, and providing moral support to fellow detainees, among other tasks." The report notes that seized al-Qaeda training manuals offered guidance on how members could organize and recruit while imprisoned, with one manual even including a diagram titled "Organization of Barracks Net." The diagram is recreated in the document, which was prepared with information contained in reports from the CIA, FBI, Department of Defense, National Security Agency, and various overseas intelligence services. In addition to al-Qaeda tactics, the report describes how terrorist groups like Hamas and Egyptian Islamic Jihad have operated behind bars and how some foreign governments have failed to stem organizing efforts by detainees. While noting that "harsher disruption efforts are needed once terrorists have established a substantial prison network," the CIA report concluded that since such activities may be "constrained by countries' need to follow the rule of law and other typical investigative hurdles, it may be possible only to mitigate, not prevent, terrorist use of prisons for their own purposes."